Same broker that handled 1999 WallStreet.com sale will auction Malibu.com. 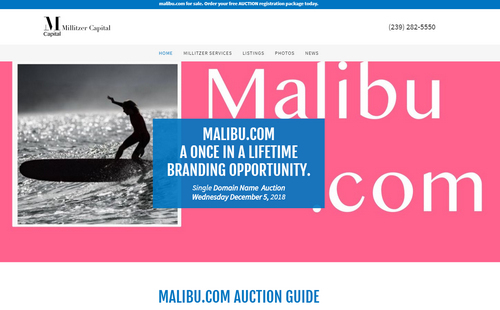 Malibu.com will be auctioned off on December 5 with a starting bid of $250,000 and no reserve. There’s a standing offer of $250,000 and a $25,000 bidding increment, so the domain will cost at least $275,000 if you want to buy it. Millitzer Capital, which auctioned off WallStreet.com for $1.03 million in 1999, is handling the auction. Details are at Malibu.com. There are a couple of things about this domain auction that are notable. First, Malibu is more than a city. It’s also a brand including the popular rum brand. Second, there’s no reserve, so the domain will sell next month for at least $250,000 assuming that the standing offer goes through. Even at $250,000 it will be a notable sale.